Private and secluded yet minutes away from town, our 3 bedroom/2 bathroom apartment is located in a secure gated apartment complex with heated swimming pool (October to April) and is fully self-contained including full kitchen with dishwasher, and laundry facilities. Two kayaks are available for our guests to use free of charge. Bedding configuration includes two double bedrooms (queen beds) and 1 bunk bed room which sleeps four - perfect for families and groups. Linen and towels are provided. Ideal for year-round holidays, there is a purpose built drying/storage room to air out your ski gear after a day on the slopes and a mooring for your boat or jet-ski directly outside the apartment. The apartment has an internal garage for covered car parking and has direct access to the river banks for fishing, water sports and picnics. Curved TV, high quality soundbar audio system and free wifi internet and Netflix. * Portacot and high chair available (renter must supply own linen etc for cot). Enjoy riding our wonderful mountain bike tracks which are located just 5 minutes ride from the apartment and cater for all riders or simply ride into town for a coffee or along the Lions walk on the lake shore to Wharewaka Point. Min stay 2 nights. 3 nights min during Easter. 5 nights min for IronMan and during summer holidays / peak times. There is strictly a NO PARTY policy for this apartment. Greg and his wife Linda have travelled extensively and after living in Italy for six years feel that they have a good feel for what makes a great holiday experience. We are thrilled to share our lovely apartment with our guests - so that they can experience the beautiful location too. Being absolute riverfront gives unbelievable views of the tranquil waters flowing past the apartment. We are experienced hosts and want to make your Taupo holiday memorable and really enjoyable. Fantastic location with modern open-plan living areas, wonderful water views and balcony. Peaceful location only minutes walk into Taupo township. Swimming pool onsite is free for our guests as are the kayaks that we provide. Free high speed internet is available and we offer free Netflix too. The river is the primary view but glimpses of the lake can be seen from the balcony. Located on the banks of the Waikato River. Absolute riverfront location. Beautiful water views from the master bedroom and living areas. Underfloor heating in bathrooms and kitchen. Wall heaters in bedrooms. Electric blankets also provided. All linen provided except for infant's cot - if required please bring linen for this. Free, secure double-car garage onsite. Below the apartment for internal access. Two car parking. Bath and pool towels provided. Spacious living area with beautiful river views. Limited spices, sugar, tea, coffee and oils supplied. Full kitchen facilities including dishwasher, fridge/freezer, oven/hob, microwave. Six seated comfortably. Two bar stools also provided. Curved TV with sound bar. Free wifi and Netflix. Bluetooth connectivity with sound bar for audio. River views from balcony. Two chairs and small table. Two free kayaks (with lifejackets) provided free of charge. Beautiful open-plan penthouse style apartment with amazing river views. Three bedrooms, two bathrooms. Full kitchen and laundry facilities. Free wifi and Netflix. Double-car garaging beneath apartment. Two kayaks also provided free of charge. Swimming pool available over summer. We had such a fantastic stay. We had such a fantastic stay. Well equipped holiday spot. The townhouse is in the most ideal location. 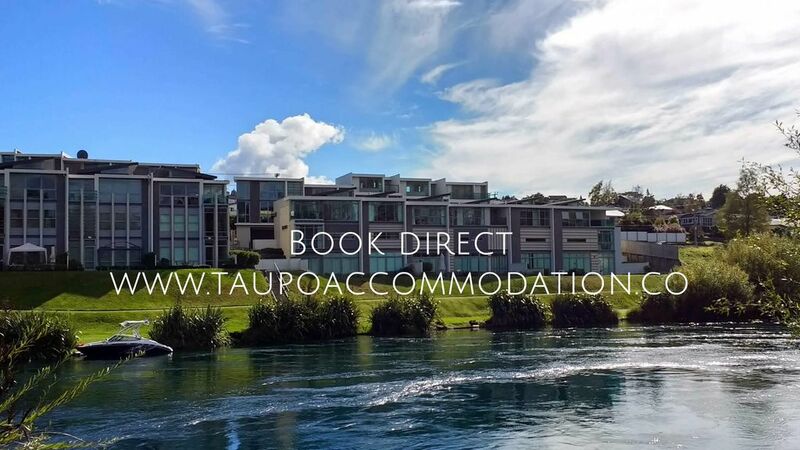 Walking distance to town, easy drive to Acacia Bay and everything else Taupo offers. We were there for the summer concert and loved watching all the boats lining up on the river to listen in to the concert. Our kids loved swimming in the pool and the river. Thanks for a fantastic stay. We hope to be back again next year! Really lovely place to stay in taupo. Awesome place lovely outlook. Close enough to walk to town or taxi only $10. Great for families just a shame pool not heated in winter. Hi Kirsty, really glad you enjoyed your stay, our apartment and the location. It is lovely and central isn't it? Unfortunately heating the pool over winter isn't possible as this is run and dates are set by the Body Corporate. It is heated from Labour Weekend through until Easter though, so if you come back (and please do!) between these dates it will be heated. Property is awesome but watch out with the expectation with cleaning! Property is awesome but watch out with the expectation with cleaning!! Hi Anna, we don't expect renters to clean the apartment, that is what the cleaning fee covers, however as explained in our rental agreement, and not unreasonably, we do have an expectation that guests leave it in a tidy state - rubbish removed, used beds stripped and clean dishes. Tongariro Alpine Crossing and Huka Falls are must sees!